BRUSSELS, Belgium—A month before attending to much more tragic business here in the Belgian capital, Didier Reynders arrived as a guest of honor at a luxurious and playful 90th birthday party that Godiva, the renowned Brussels chocolatier, was throwing for itself at the city's beautiful art deco Albert Hall. The presence of the country's foreign affairs minister spoke volumes about the respect and affection Godiva engenders locally. Indeed, Reynders lavished praise on the brand in a speech at dinner, pronouncing it a global success of which all Belgians could be proud. He also joked, briefly and good naturedly, about how to pronounce the Godiva name. Is it "Go-DIE-vah," as it would be pronounced by an English speaker? (Lady Godiva, after whom the brand is named and who adorns its logo, does hail from Anglo-Saxon mythology.) Or is it "Go-DEE-vah," as Belgians would typically pronounce such a word? Didier Reynders inspects Oli-B's new artwork for Godiva. It seems trivial, but in some ways it's a loaded question. It reveals a bit about the split nature of this famous and now decidedly international brand, and the parallel (sometimes conflicting) values, strengths and opportunities it will be juggling in the decade leading up to its centennial—opportunities it must reconcile in order to grow share in an ever-more competitive global chocolate market. The seemingly opposing forces buffeting the brand are everywhere. This is a European brand that treasures its local Belgian history yet is looking to North America and Asia for growth. It's a brand that wants to be premium yet accessible—and whose products are both hand-crafted and mass-produced. It's a brand that historically has emphasized gifting but whose recent innovations are in self-treating. And it's brand whose products are rightly celebrated, but whose packaging—the iconic gold box—might be its single most valuable asset. In this 90th anniversary year, there's one more relevant tension, too: This is a brand that understandably wants to look back and celebrate its rich history, yet must also be razor-focused on evolving for the modern age. Adweek was in Brussels for the 90th anniversary party, and related events. There, we asked Michelle Chin, head of marketing and product development for Godiva North America, about that latter balancing act in particular—the pull between past and present. By way of reply, she quoted Pierre Draps Jr., who ran Godiva for decades until his death in 2012—and whose father, Pierre Sr., started the whole enterprise when he began making praline (the kind of chocolate candy, invented in Belgium, that features a shell with a softer filling) at his confectioner's workshop in Brussels in 1926. "He said, 'Chocolate is a dream.' And that's an inspirational quote for us," Chin says. "It allows to say: We recognize where we've come from, and we recognize the values this brand stands for. But it is a dream. And a dream is always continuous, and so we're always looking at where we go from here." If chocolate is a dream, the 90th anniversary party was a perfect embodiment of it—at times surreal and dreamlike, with flashes of flavor at every turn. Billed as a experiential event, it took place in three distinct spaces inside Albert Hall—the Heritage Room, the Multi-Sensory Room and the Innovation Room—a kind of past, present and future of Godiva that showcased the company's legacy, culinary artistry and innovation. The Heritage Room featured historical artifacts (including some of Pierre Draps Sr.'s original handwritten recipes); live chocolate-making demonstrations by Godiva's five chefs; and a large "Aroma Organ" that celebrated the flavor notes of Godiva ingredients as if they were actually music. The Multi-Sensory Room contained giant Godiva gift boxes and chocolate pods, inside which guests were served pieces of Godiva chocolate. But each of the fanciful installations was designed to enhance senses beyond taste—like sight, smell and touch—to somehow enhance the flavor of the chocolate. While the Albert Hall event was an exclusive gathering, far from everyday consumers, it marked the formal introduction of 90th anniversary products and packaging that will dominate Godiva's communications through 2016. Most notably, the brand is introducing a 90th anniversary version of its iconic Gold Collection. It features nine chocolates—one from almost every decade in Godiva's history, including a new piece. The collection hits North American stores this Monday, April 4. The pieces in the new collection include the Lady Noir, based on one of Pierre Draps' earliest recipes; the Signature Lait, a coffee ganache decorated with a feather that was created for the movie Gone with the Wind in 1939; the Ecusson, a liquid caramel encased in milk chocolate and decorated with a lion, which marked Godiva's appointment to the Royal Court of Belgium in 1968; and the brand-new Egérie Noir, a raspberry ganache balanced with essence of rose petals and encased in dark Belgian chocolate. "Our Gold Collection is our icon," says Chin. "You can imagine over the course of 90 years we've been changing the assortment a lot. This is about going back into history and celebrating, for each decade, which [piece] was the most symbolic, which was the favorite, which one was the most symbolic representation of that decade." It's a product push that's heavy on history. But Godiva balances it out with special packaging that skews younger. The bright, colorful, confetti-like imagery was designed by Oli-B, a Belgian artist who, not coincidentally, is a millennial—the market that Godiva, whose core consumer skews a bit older, really needs to court. "We searched for a Belgian artist who had a good marriage between being able to celebrate our heritage but also look into the future," Chin says. "Oli-B is a contemporary artist, and quite creative in his look and feel, and the energy he brings in his artwork—we thought it was a great combination. The confetti feel is very festive but also very relevant. And when you have it as a juxtaposition against our gold box, it should tell the consumer that a new Godiva is on the horizon for the next 90 years." Godiva's traditional gold box is an icon all its own, as Adweek noted in this story last year. And the brand frequently collaborates on packaging for special collections with artists eager to make their mark on such high-profile, consumer-facing canvases. Oli-B's designs will be used beyond the packaging, too. They will appear in stores and online this year. "It's an opportunity for us to really skin the site," Chin says of the web component. Also, the raspberry-rose flavor from the collection's new chocolate piece will be infused into other Godiva offerings—including self-treat lines this summer (including Godiva's soft-serve ice cream and Trufflelata shakes) and a fall launch of truffles in the same vein. Oli-B's confetti design will be used around those products, too. The 90th anniversary celebrations in February extended beyond the night at Albert Hall. Godiva also invited the media and other guests to tour its chocolate factory in Brussels, with cameras rolling. 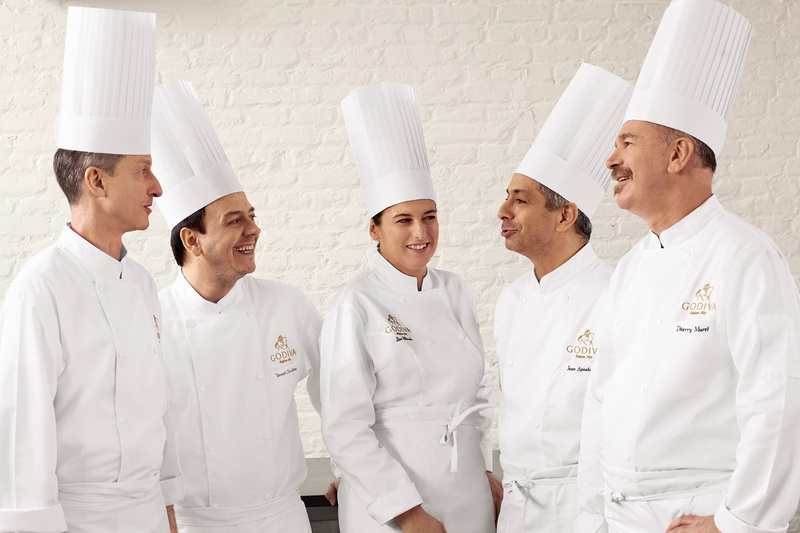 The company's five chefs (from left: Philippe Daue, Yannick Chevolleau, Isle Wilmots, Jean Apostolou and Thierry Muret)‚ were a major focus of both the 90th anniversary party and the factory tour, and are expected to be featured prominently in the marketing materials this year. "We feel digital is really a great opportunity for us," Chin says of the company's media mix. "Consumers love getting the stories behind the brand. From the perspective of the 90th, it's a great opportunity for us to capture the activities from the week—from the chef inspiration to the original family inspiration to the values of Lady Godiva to how Oli-B as a modern artist fits the values Godiva stands for—that's the story we want to share." She adds: "Whether you're interested in the history of the brand, or the inspiration of the shops, or you just purely want to enjoy the last 90 years worth of Godiva chocolates, it's a great opportunity to experience it all." Chin says she'll be looking at metrics like traffic to Godiva.com, time on site and shareability of the content in social to gauge the success of the 2016 marketing. Plus, of course, there is the crucial business metric of driving sales. Godiva's legacy isn't in question. But its future consumer is. And Chin says the brand is focused on getting younger and securing the loyalty of the next generation. "Our current consumer is a female in her mid-40s who tends to be bicoastal, loves premium chocolate and loves Godiva," Chin says. "We think there's an opportunity for us to bring a younger consumer in. We're looking at the older end of millennials, 30-35. They're really familiar with the brand. We have very high awareness in North America. And now it's really about offering products that fit her lifestyle." That means not just gifting but self-treat products, too. "We have to enter her life through our products," Chin says. "She's busy, she's on the go. So when she wants to treat herself, she can enjoy a soft-serve or a Trufflelata, which is a shake blended with truffles. We also have dipped strawberries, which are a perennial favorite of ours. It's a great way to indulge with a bit of a health skew to it." Along with the products, there is the broader brand mission—which is more ephemeral. "For us, what's most important is pushing the emotional connection that consumers have with the brand," says Chin. "Godiva means a lot of different things to people, but it really comes down to one thing—sparking joy and delight in consumers. That's really what we stand for at the end of the day. … The chocolate is always there. It's important for us to make sure we're giving the consumer a 'wow' throughout the whole experience." The brand clearly hopes the 90th anniversary will be a big "wow" moment. In many ways, it's a chance to reconcile the brand's bifurcated nature—to lean on its historical strengths as a way of bringing more people in and charting a course for the future. If all goes well, the Godiva name will continue for another 90 years, no matter how you pronounce it.